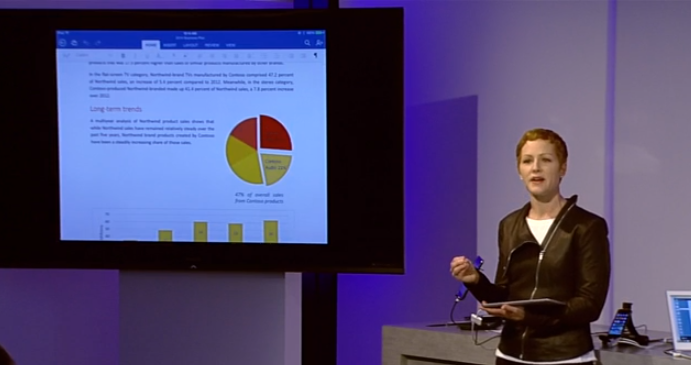 Today at its press event in San Francisco, Microsoft unveiled Office for Apple’s iPad. The news, while expected, matters: Microsoft supporting Apple’s tablet marks an important moment for the company and its platform strategy. The code will be live at 11 am, today in the iOS App Store. Specifically, Word, Excel, and PowerPoint will be available on Apple’s mobile platform. The applications are built atop of OneDrive in that they support cloud storage, and will allow for real-time collaboration among a number of users. Microsoft cited up to five, though it isn’t clear precisely how many the limit is in Word. If you have an Office 365 subscription, you can edit, but if you do not, you can still download and view. Office 365 subscriptions start at $6.99 per month for a personal plan and $9.99 for the Home Premium version that allows users to install Office on up to five PCs or Macs.